This is the starting position. 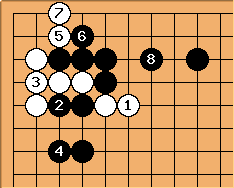 A variation of a 5-4 joseki, with White playing tenuki. So why not play in the first place (followed by in the previous diagram)? Because the correct style is to not help your opponent in any way. 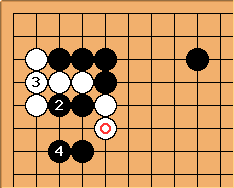 This is the sequence Black is hoping for is (ko lock). White is completely blocked off from the center. This is what I mean by hoping for the opponent's mistakes. Black didn't overplay but the order of moves leaves more scope for White to make a mistake. Charles Matthews: Examples from pro play do back up this theory about Black's order of play. here is in fact the common way to react to . Andre Engels: In which way do they back up this theory? If this is the actual reason, I would expect professionals to play both sequences, since their also professional opponents would never make such a fundamental error in a well-known position. 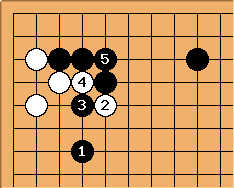 If Black actually uses only the joseki move order in professional games, I would think that there has to be another reason. My guess would be that the reason is that it has to do with the (very small) possibility that White would answer at here. Black has two answers here: and Black a - White b - Black c. If Black does choose , leaving the Black a - White b exchange unplayed is a plus. 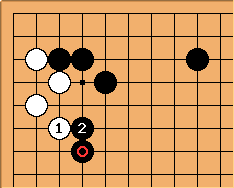 Of course this is only a variation of a move ( ) that is played rarely or never, but I guess that's still at least as often as in the 'mistake' diagram is correct, so nothing is lost in being prepared for it. Charles: The total number of examples Gobase+GoGod is only six (and in one Black makes a hanging connection not a solid connection) so too small a sample. It's always the same order, though. Also I wonder about the diagram. I'd certainly expect and here from Black. Now White needs to spend time living in the corner. Good thing I said that. Here's an example from a book by Otake Hideo, which is presumably from a pro game though I haven't traced it. 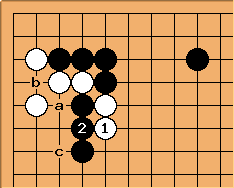 Here it seems natural for Black to fight back with when White plays (kake). Black has everything to gain by expanding the lower left by fighting. In this case White does play atari before the connection . Variation - good for Black? 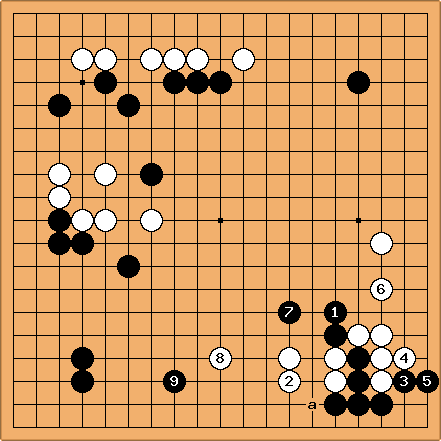 It is logical to assume here that the reason is that up to in this variation is interesting for Black, when is played immediately. The stone does look well-placed now, and perhaps White loses control over the lower side. 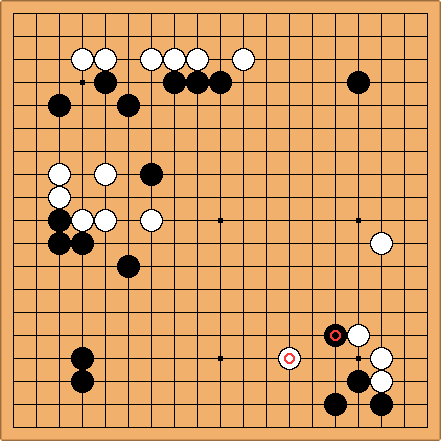 This followed, and Black's strategy adds up to a reasonable balanced game. 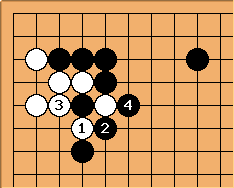 White has two weakish groups, the one on the lower side not really being weak now since White a threatens the corner. 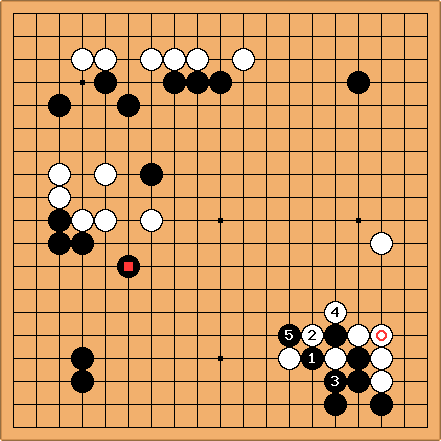 Black has a single weak group only.